(U.S. Patent Nos. D465,234 S and D668,703 S) - Made in the USA ! Only 28,90€ ! 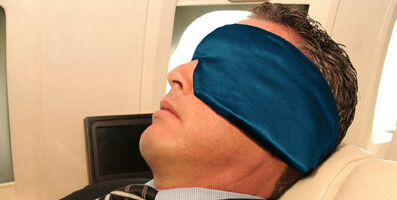 With its unique patented design, Sleep Master is an adjustable sleep mask with built-in sound muffling. Sleep Master was invented for people with sleeping difficulties, for those who just enjoy napping during the day or while traveling, and even for those whose partners insist on watching TV or reading late into the night. Sleep Master is an all-in-one sleep mask that combines light elimination and sound reduction, the conditions necessary for deep sleep. Sleep Master's comfortable fit and relaxing effect quickly induces an amazingly deep and refreshing sleep or nap. A one-size-fits-all, user-friendly, simple product, Sleep Master allows you to enjoy healthy and natural sleep. Light and easy to carry, use Sleep Master anytime, anywhere. With its exclusive patented design, and use of the highest quality materials, Sleep Master is the finest and most effective sleep mask available on the market today. AND THE PRICE IS AN AFFORDABLE 28,90€ ! And, for you ladies, we've all heard the saying "Nothing looks better on a woman than a good night's sleep." Well, Sleep Master takes this concept even further - in addition to its sleep effect, a special bonus is that Sleep Master actually keeps your hairstyle in place during sleep! Wake up, take off Sleep Master, and you are ready to go... No bedhead! "Hello folks at Sleep Master! I have had my Sleep Master sleep mask, which at this moment is perched on my forehead for pre-bedtime, for literally 12 years. This thing saved my life. I'd been a terrible insomniac for years. I also get severe migraines. In fact, I'm at the point where it's like my "Linus blanket," in that I sleep fitfully if ever I forget it at home. As far as the migraines, I've been getting them since age 5. Before my Sleep Master, these were awful days, as nothing was sufficient to block noise and sound. Over the past 12 years though, my migraines have been livable. Nothing blocks light better than the Sleep Master. Anyway, thank you for continuing to make this amazingly helpful, excellent quality product!!" "In 2003 my husband bought me 4 face masks for Christmas so I could try several different brands. One of them just happened to be a Sleep Master. The other three didn't come close to comparing! The Sleep Master: I LOVE IT!!! I am buying 3 for my kids because they keep stealing mine. :) Six years later it is still in great shape, has served me beautifully in hotels, on airplanes and at home. It's comfortable, soft, doesn't mess up my hair during travel and blocks out all light. I recommend Sleep Master to everyone! Thank you Sleep Master for creating such a great product!" Buy Sleep Master Here. Made in the USA! Sleep Master ® Sleep Mask - Color Ocean Blue- One Size Fits All - An affordable 28,90€ (plus 0.00€ shipping and handling for customers within Germany - 2,90€ for International shipping). Sleep Master is a unique and revolutionary Sleep Mask. With its built-in sound muffling, Sleep Master is an all-in-one Sleep Mask that combines light elimination and sound reduction. 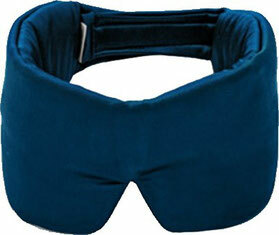 Sleep Master's comfortable fit and relaxing effect quickly induces an amazingly deep and refreshing sleep or nap. To easily purchase Sleep Master for yourself or others, just enter your order in the shopping cart, click on "In den Warenkorb", and follow the easy checkout instructions. Thank You!